Some of you who have been following along with this blog for some time now will undoubtedly notice that my posting has been light for at least a month now and my reasons have been significant. I’ve been spending all my time (for the most part) over on InfoBarrel writing and posting articles to build more residual income. Basically I’ve been using InfoBarrel to increase my residual earnings over the past two weeks in two ways: revenue sharing and backlinks to my other online content. You may want to check out my updated InfoBarrel Review here. If you’re unsure what InfoBarrel is it’s basically the same thing as eHow except that you don’t have to write in a ‘How-To’ format to post articles. Additionally InfoBarrel will let you link out to outside sites in the articles you post there. The links are very nice because they are dofollow links and the articles are indexed almost always the same day. The revenue share is very upfront and understandable as well. They give you a solid base revenue share and allow you to increase it based on the posting volume you hit every month. They let you earn residual income on your articles from two different sources: Adsense and Chitika ads. They also have integrated G Analytics allowing you to see page by page details of stats if you set it up. All of this is very nice… probably even nicer than eHow but since I’ve already posted some 70 eHow articles already they aren’t going anywhere. I can however support those eHow articles by writing similar articles on InfoBarrel and linking out to the eHow articles I’ve already written. I may not be enthusiastic anymore about pumping out 50 eHow articles but another 50 InfoBarrel articles will surely occur this month… and in the next two weeks probably. Over the past 15 days I’ve posted 51 InfoBarrel articles each linking to my eHow articles and to my Longevity blog. Each article is unique but similar in nature to the articles I’ve already written so the backlinks are quite relevant and there is no research time required for any of these articles. 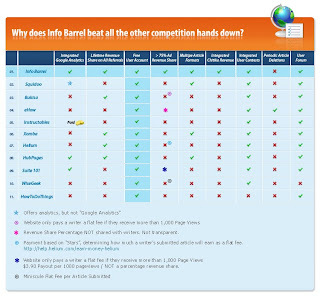 As a result of all this I now have an additional 51 and counting money making articles on InfoBarrel and 100+ backlinks making my eHow articles and blog posts stronger in the SERPs. You might be curious how I’ve been doing this considering I work a day job but I say it’s easy because I already know what to write about. I’m just writing articles related to things I’ve already written. The articles are about 500 words a piece and I can whip them out very quickly. The keyword research has already been done so there’s not much to do but track what backlinks I’m throwing up. As of right now I’ve backlinked 95% of my eHow articles at least once and about 60% of them twice. 20% of them have even been backlinked at least three times. It’s fantastic. Not only do the backlinks get thrown up quickly but in less than one week my IB articles already started earning. On my 7th day I had somewhere around 30 InfoBarrel articles posted and I made my first dollar. After two weeks (yesterday) I had 51 articles posted and I made another two bucks and change. In the past 2-3 days my analytics are starting to show a significant increase in search traffic to the articles so I know that more earnings are just around the corner. BTW, on a earnings per 1000 PV basis InfoBarrel is almost twice as high as eHow for me at this moment however this will likely level off as volume of page views accumulates. How about the backlinks? They are already seemingly working. I can’t be sure until at least the end of December but my earnings per 1000 page views at eHow increased to an all time high in November. Because November was a short month however and had a four day holiday weekend my overall earnings were slightly flat at eHow so by December’s end I should have an idea whether these backlinks are helping. I should say right now that I think they are helping as my keyword rankings are far better at November month end than at November month beginning so I think this will only lead to more PV in the month of December. We’ll see how it goes. I do know that backlinks into the same article from the same domain start having less of an effect after 5-10 backlinks which means if I wanted I could backlink from IB into eHow articles about 5-10 times per eHow article before I stop experiencing benefits. This will take some time even at a rate of 120 articles per month. So anyway, InfoBarrel also offers a referral program and I am so impressed with them that I will be actively promoting the program here on this blog. Head over to InfoBarrel and start making some money and backlinks and support me and my cause while you’re at it. I’d appreciate it. I’ll continue to provide guidance on my progress as the day’s, week’s, and month’s progress. So let this be the baseline. Join InfoBarrel and post 50 articles in your first two weeks and you’ll likely make $1-$5. We’ll see how this increases in time. Update 12-10-09 - x3xsolxdierx3x (Howie) a leading InfoBarrel contributor created this comparison chart of Infobarrel and other user content generated revenue sharing platforms. I think it speaks for itself when you look at it from a which platform is worth my time stand point. Click to enlarge. Again, let me say if you'd like to signup for InfoBarrel I'd be honored if you let me refer you. Just click here and allow me to refer you or you can click here for a non-referral link. I have just started on InfoBarrel - I submitted an article that has not been published yet. I would love to hear how your last month has gone! Hey Meryl, thanks for your interest and I'm happy to see you giving InfoBarrel a try. I'm planning a recep of my December earnings which I should post in the next day or two and will give a lot of info on my InfoBarrel progress thus far. As a sneak peak however I'll say that the initial income potential at IB is lower than the initial income potential at eHow from my experience however I believe IB is going to do very good for me in the long run. Check out my next post and see what I mean. I have just discovered your blog as I am looking at starting writing with IB. A quick question - I have some articles on ezine already. I was going to move them to IB but after reading this, wondered if a more effective strategy would be to leave them and write related articles on IB and then backlink. I'd be interested to hear your thoughts. Hey Jen, I rarely go back and move articles. I'm not sure what your purpose for posting them on ezine was in the past but (not knowing your situation) I would just say march forward. Post new stuff on IB, backlink that stuff and move on. Forget about what you did in the past. As long as you make forward progress you'll eventually get to where you want to go.